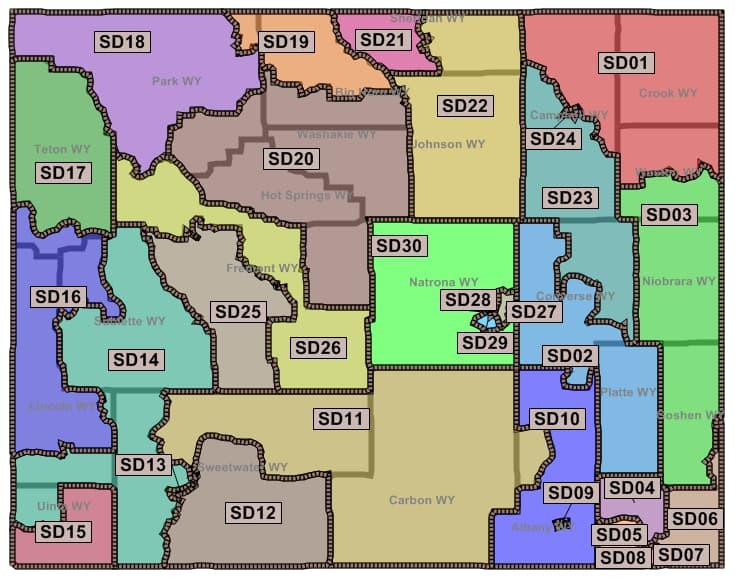 It’s primary election season in Wyoming, and this year 15 of Wyoming’s 30 State Senate seats are up for election on August 19. Seven of this year’s GOP Senate primaries are contested, and in each mainline Republicans face challengers running to the right. There is only one contested primary among Democrats, which features two candidates from the Wind River Indian Reservation. Though voter turnout in Wyoming’s primaries is typically low — 32 percent in 2010, and just 25 percent in 2012 — primary elections factor significantly in the makeup of the state legislature. That’s because GOP candidates who win the primary have a major advantage over Democrats in the general election due to the overwhelming number of Republicans in the state. Many of the GOP challengers share a common background of having served on the precinct committees of their local Republican party, or attended the Republican State Convention in Evanston this year. In many cases, their opponents align with numerous grassroots conservative groups that abound in Wyoming. These include local Tea Party chapters, Conservative Republicans of Wyoming (CROW), Wyoming Watchdogs, the Wyoming Liberty Group, Independent Cattlemen of Wyoming, Wyoming Campaign for Liberty, and others. Popular platform planks for GOP challengers include opposition to the Common Core education standards and the recently passed 10-cent increase on the fuel tax. Many of them aim to unseat legislators who voted for Senate File 104, the bill to remove the Superintendent of Public Instruction from leadership of the Department of Education, which the Wyoming Supreme Court ruled unconstitutional in January. However, Rothfuss said he believes the higher level of participation and organization of ultra-conservative voters can lead to higher voter turnout, which can give challengers an edge over incumbents. “Realistically, they shouldn’t be able to win, but they can,” he said. Attorney and two-term incumbent Sen. Drew Perkins (R-Casper) is the second-ranking member of the Senate Appropriations Committee. He formerly chaired the Judiciary Committee (2011-2012) and the Select Committee on Capital Finance and Investments (2011-2012). Perkins faces primary challenger Bob Ide, a Casper landman. In the coming session, current Senate chair of Appropriations Sen. Eli Bebout (R-Riverton) will likely become Majority Floor Leader, leaving Perkins in line to be the next Senate chair of the committee. In that position, Perkins would have significant power over spending policy for Wyoming’s $3.5 billion General Fund. Ide describes himself as a conservative Republican. His wife Cathy is the Natrona County coordinator for the Wyoming Chapter of Campaign for Liberty, a 501(c)4 libertarian group founded by former presidential candidate Ron Paul. Ide said he supports school choice, the concept of transferring federal lands to the state, eliminating corporate subsidies, and the ability of citizens to use “anything they like” as legal tender. He came to Wyoming to work as a ranch hand, and in 1986 started his own an oil and gas lease brokerage and commercial real estate firm in Casper. Stubson said that Ide is well known in Casper and has the finances needed to run a strong campaign. The other committee chair facing a challenge this year is Sen. Cale Case (R-Lander). 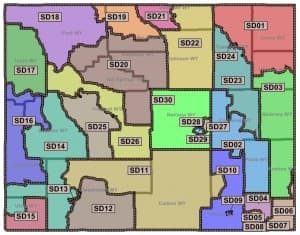 Case represents Fremont County District 25, which has attracted three Republican challengers, plus two Democrats this year — more candidates than any legislative district in the state. That’s likely because of the varied Democrat, Republican, Eastern Shoshone, and Northern Arapaho constituencies of the district along the Wind River Front. Case has served in the Wyoming Senate since 1999, and before that in the Wyoming House from 1993 through 1998. He has chaired the Senate Corporations, Elections, and Political Subdivisions Committee since 2005. 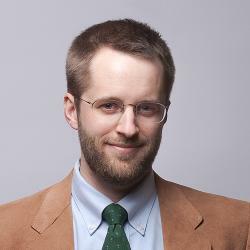 Trained as an economist, he is known for taking contrarian positions that follow his libertarian principles. Case’s three GOP primary challengers: Jennifer McCarty, a libertarian/Tea Party candidate from Lander; Joe Malek of Lander, perennial candidate and auto-body shop owner; and Allen Whiteman, a Northern Arapaho tribal member who lists his PO Box in Riverton. As with any primary, an incumbent like Case has the advantage of name recognition and familiarity with voters, which gains more leverage if multiple challengers split the opposition vote. The winner of the District 25 GOP primary will face a Democrat opponent: Either Sergio Maldonado, Central Wyoming College Diversity coordinator and Northern Arapaho Tribal Member; or Travis Brocke, Eastern Shoshone Tribal Engineer of Fort Washakie. The Maldonado/Brocke race is the only contested Democrat primary for Senate this year. Two-term incumbent Sen. Bill Landen (R-Casper), who chaired the Select Committee on School Facilities (2013-2014) and the Wyoming Health Insurance Exchange Steering Committee (2011-2012), faces challenger Kara Rae Linn. Linn works as an executive recruiter, and has served as precinct committeewoman and delegate to the state Republican convention. In Senate District 1, rancher and freshman Sen. Ogden Driskill (R-Devils Tower) faces challenger Tony Johnson of Rozet and Judy McCullough of Moorcroft. Johnson is a pastor and social conservative. McCullough is a rancher and founding member of the Independent Cattlemen of Wyoming. Veterinarian and freshman incumbent Sen. Fred Emerich (R-Cheyenne) faces Rep. Lynn Hutchings (R-Cheyenne) in Senate District 5. Hutchings is a freshman member of the Wyoming House known for her conservative social views. In 2013 she received national notice among marriage equality advocates for testifying against a bill in support of domestic partnerships. In the southwest corner of the state, optometrist and freshman incumbent Sen. Paul Barnard (R-Evanston) faces challenger Karl Allred, a gas plant operator from Evanston. Allred served on the executive committee of the Wyoming Republican Party, where he worked to move the party headquarters to Cheyenne. Earlier this year, Allred sponsored a resolution among state GOP executive committee to ask Gov. Matt Mead and the legislature to accept the Supreme Court’s ruling on Senate File 104, and not pursue a special session or a rehearing. Read this Casper Star-Tribune piece for more. The winner of the Barnard/Allred Republican primary will compete against Bret McCoy, the sole Democrat running for the seat. 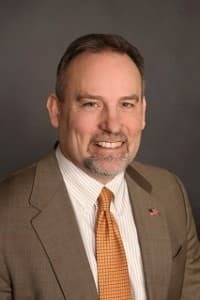 Republicans Jeff Raney and Jeff Wasserburger, both of Gillette, will face off in the primary for the Senate District 23 seat vacated by veteran lawmaker Sen. John Hines (R-Gillette). 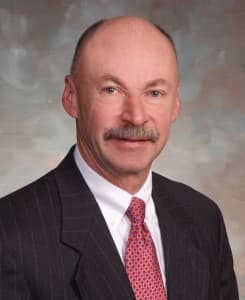 Wasserburger previously served in the Wyoming House from 1995 through 2007, and chaired the House Judiciary and Education Committee. He’s a proponent of coal exports to Asia, and the effort to remake the College of Engineering at the University of Wyoming. Raney is a small business owner who deals in ammunition and historic firearms. He supports concealed weapons in schools and on college campuses, nullification of the Affordable Care Act, and the effort to transfer federal public lands to the state. Cheyenne architect Stephen Pappas (R) and Dameione Cameron (D) will face each other in the general election for the Senate District 7 seat vacated by Sen. Leslie Nutting (R-Cheyenne). Pappas is an architect, and Cameron is an attorney who is chef/owner of the Morris House Bistro. Incumbent Democrats Sen. Chris Rothfuss (D-Laramie), Sen. John Hastert (D-Green River) have no opponents for the primary or general election. Unopposed Republicans include Sen. Curt Meier (R-LaGrange), Sen. Larry Hicks (R-Baggs), Sen. Leland Christensen (R-Alta), Sen. Ray Peterson (R-Cowley), and Sen. Bruce Burns (R-Big Horn). Rothfuss predicted that after this year’s primary elections, the membership of the Senate will remain largely the same, with the exception of the two members who retired. “The House is where most of the action is going to be,” he said. 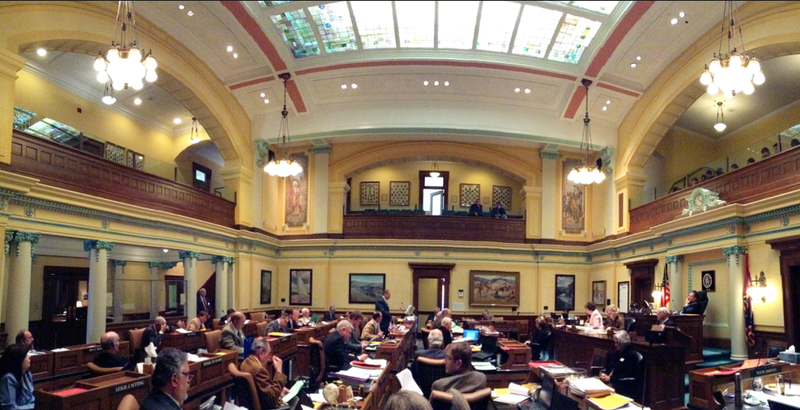 Next week on Capitol Beat: Primary races to watch in the Wyoming House. Editor’s note: This article was updated to clarify that Cathy Ide helped organize the Natrona County chapter of Wyoming Campaign for Liberty, which as a 501c4 cannot provide financial backing or endorsement of candidates. If you would like to see more quality Wyoming journalism, please consider supporting WyoFile: a non-partisan, non-profit news organization dedicated to in-depth reporting on Wyoming’s people, places and policy. Your readers need to know that there are inaccuracies in your report which could have easily been discovered. Bob Ide did not help organize the Wyoming Chapter of Campaign for Liberty. I myself am the local county coordinator for Campaign for Liberty. In addition, Campaign for Liberty is a non-profit 501c4 organization and does not endorse or finance political candidates. The election of another white man over the age of 50 will “change the complexion of the Senate?” What kind of fun-house mirrors do they have in the legislature?